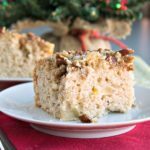 Celebrate family traditions this holiday season with a piece of Apple Praline Pecan Coffee Cake ~ Tender sour cream coffee cake full of tart apples topped with a praline pecan streusel topping! This time of year many of us revisit the family holiday traditions we grew up. It is the time of year to share memories of the past and create new ones. The kid will be 18 in a few weeks and imagines of him over the years have been popping up in my mind. He was 8 days old for his first Christmas and it’s amazing think that he is almost a grown man. It is funny how some traditions were tortuous when we were kids but make perfect sense as an adult. It would drive us nuts that mom made us eat before we could open any presents. It was nothing big, usually a coffee cake she made the night before, but it was the longest 15 minutes of the year. Later we would have a big breakfast, so it was just enough to keep us going for the morning. Now I realize she was really doing us a favor by prolonging the wonderful anticipation you experience on Christmas morning. Over time it has been a joy to watch the kid go through the same wonderfully agonizing experience. Now that he is older the pace is slower and we usually cook together. 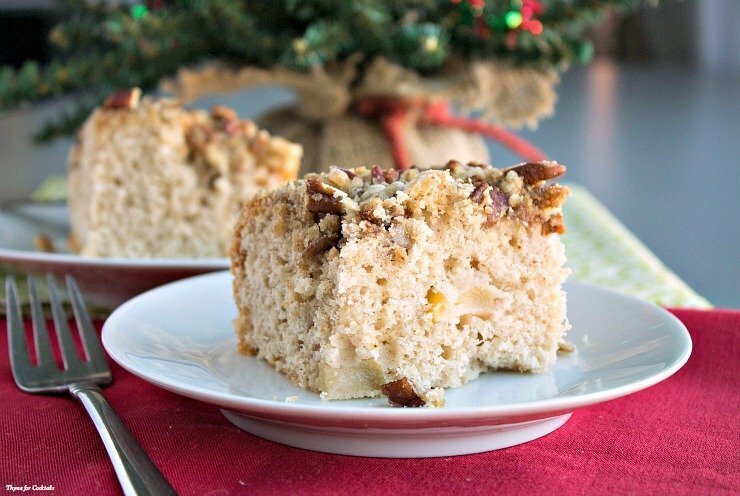 Every holiday season we have come up with a new variation of that basic coffee cake my mom made. 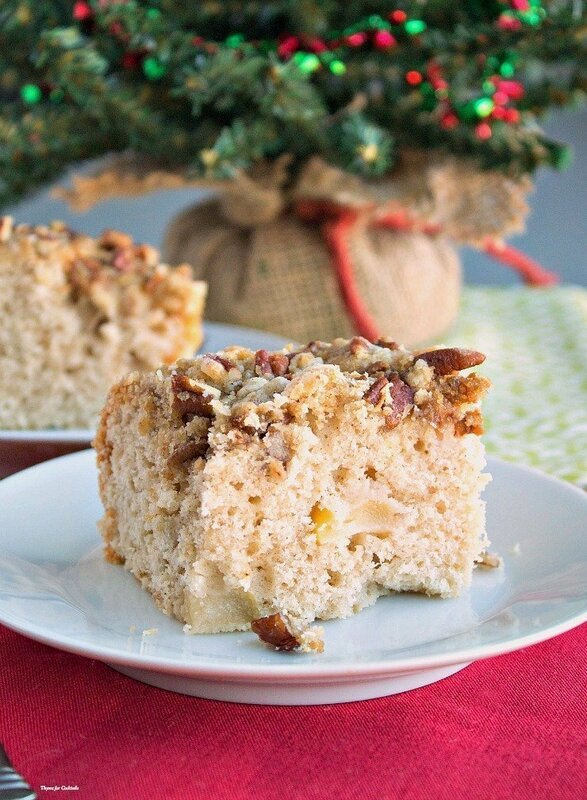 This year we are using locally grown, tart green apples and praline pecans to make this Apple Praline Pecan Coffee Cake that remind me of the praline candy my mom would make each Christmas. Apple Praline Pecan Coffee Cake ~ Tender sour cream coffee cake full of tart apples topped with a praline pecan streusel topping! Preheat oven to 350 degrees. Spray an 8x8x2 cake pan with non-stick spray, set aside. In a large bowl cream together butter and sugars. In a medium bowl whisk together remaining cake ingredients. Slowly add dry ingredients to wet, mixing well until batter is formed. Add topping ingredients to a small bowl. Mix together until it forms small crumbles. Spread evenly over coffee cake. Bake 50-55 minutes until toothpick comes out clean. Allow to cool 10 minutes. Serve warm or make ahead. 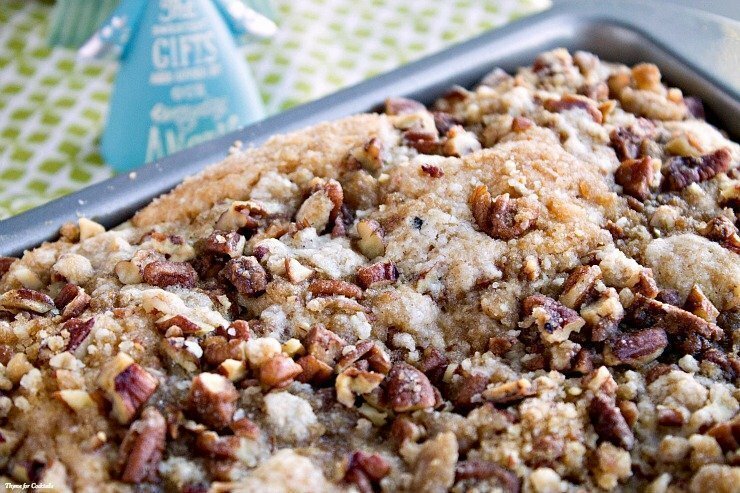 I hope you like our Apple Praline Pecan Coffee Cake as much as my crew does. If you love this delicious dessert recipe, you can find more like it by checking out my Dessert section! For recipe inspiration delivered to your inbox, subscribe to my newsletter, follow my photography journey on Instagram, and for generally inappropriate humor follow like me on Facebook! For the apple praline cake, there is no mention of apples in the ingredients…..
No apples in coffee cake ? They are there… it’s my mind that is missing 😉 There was a typo in the recipe , thanks for understanding! I loved the sound of the Apple Praline Pecan Coffee Cake, read the recipe and did not see apples listed in the ingredients. Holiday overload? I can’t believe I forgot the star ingredient. There are no apples in the recipe?? Thelma, you are a genius! I have been in such a hurry the last few days, dropping the ball on all kinds of details. Thank you.